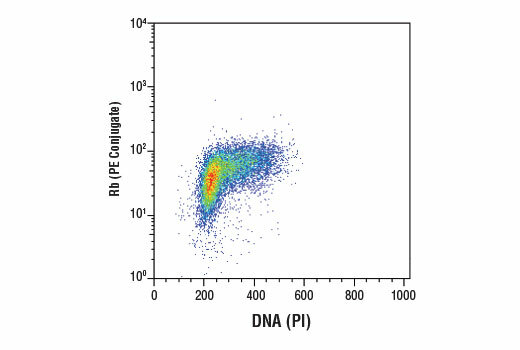 Flow cytometric analysis of Jurkat cells using Rb (4H1) Mouse mAb (PE Conjugate) and DRAQ5® #4084 to measure DNA content. Rb (4H1) Mouse mAb (PE Conjugate) detects endogenous levels of total Rb protein. The antibody does not cross-react with the Rb homologues p107 or p130, or with other proteins. Monoclonal antibody is produced by immunizing animals with an Rb-C terminal fusion protein containing residues 701-928 of human Rb. This Cell Signaling Technology antibody is conjugated to phycoerythrin (PE) and tested in-house for direct flow cytometry analysis in human cells. The antibody is expected to exhibit the same species cross-reactivity as the unconjugated Rb (4H1) Mouse mAb #9309.